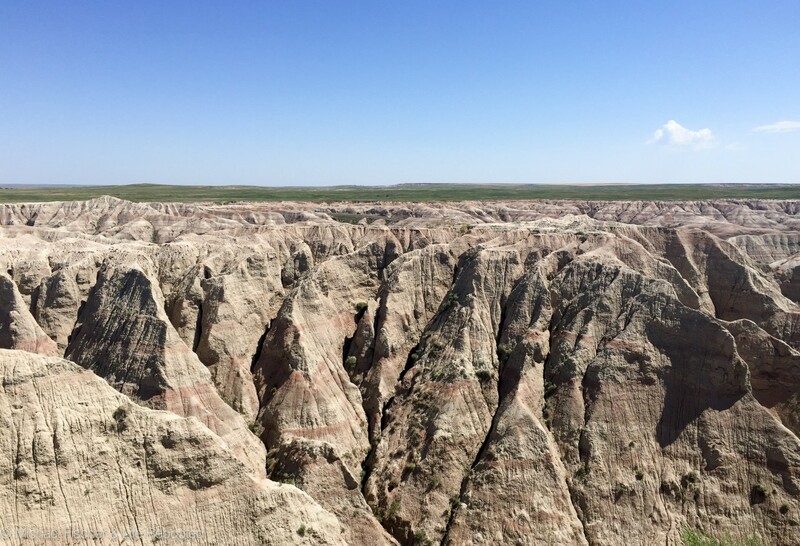 After Black Hills, we headed over to Badlands National Park. We often heard that Badlands is unlike anything we’ll ever see anywhere else and that does seem to be the case. Walking around the park feels almost like being in an alien landscape, not to mention it feels awfully desolate of animal life. Unlike most mountainous regions, Badlands is not created via volcanoes or tectonic plates colliding and lifting the earth. 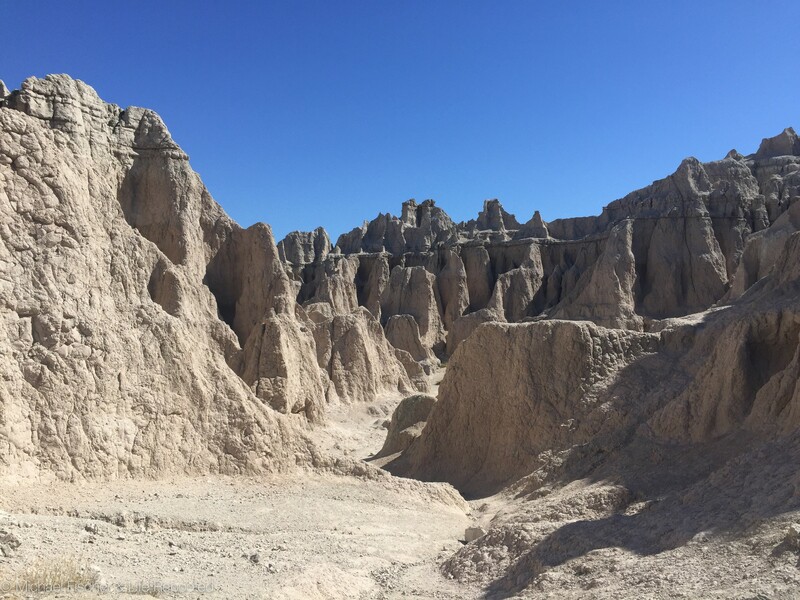 Badlands was created entirely by erosion and it continues to erode at a pretty fast pace (scientists estimate that Badlands erodes about 1 inch/year) due to the soft soil, ash, and stone layers. The ranger mentioned that formations in the Badlands (like windows) appear and disappear within one or two seasons due to the fast erosion rate. Badlands started around 80 million years ago with a seabed and ocean. Over time mud, sand, and gravel were added by runoffs, streams, and rivers flowing in the area. Nearby ash from volcanic eruptions also added layers to the area. 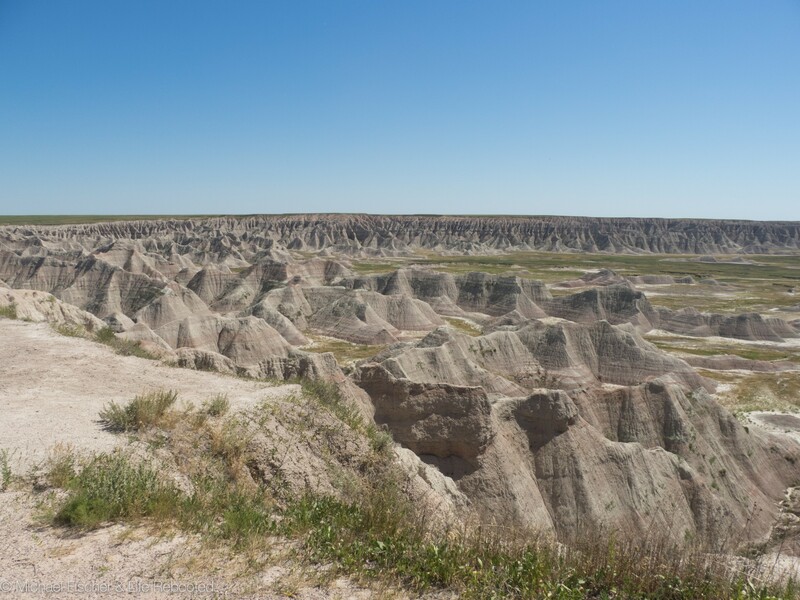 Over a few million years, layers of sand, soil, ash continued to build up the Badlands until it became a huge plains area. Then erosion snuck in and started to do her thing with water and wind to create some cool walls, spires, valleys, and buttes. At various overlooks, you can actually see the entire cycle of erosion. On one side, there are high plains covered in grass, then the erosion with various formations, then lower grassland where the erosion is complete. 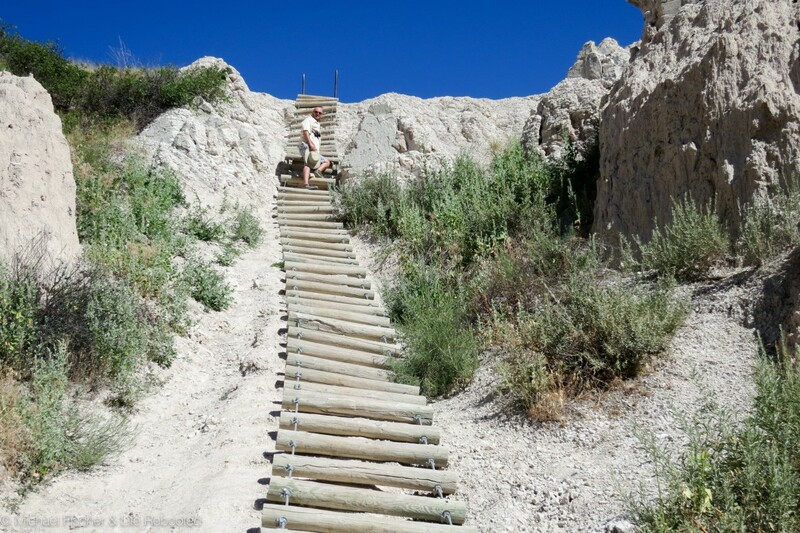 While Badlands does have some trails and paths, the public can walk off the beaten track and explore or climb where they want. The erosion or damage caused by visitors is tiny compared to that caused by a single rainfall. Even the trail markers are more like suggestions. Mike had no trouble going up the ladder, but going back down was tougher. 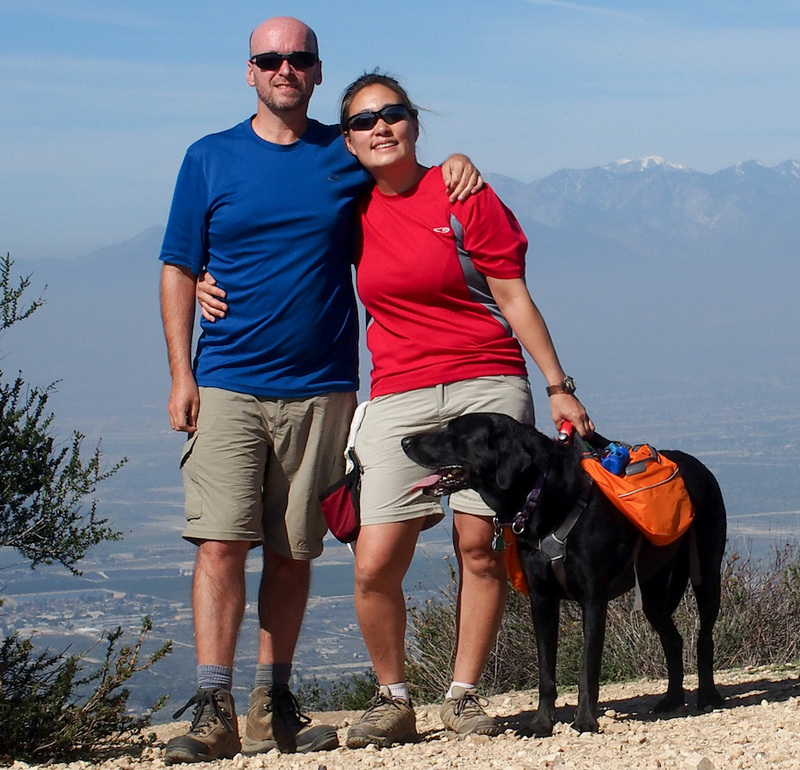 The Notch Trail (1.5 miles roundtrip) is a fun one to do. 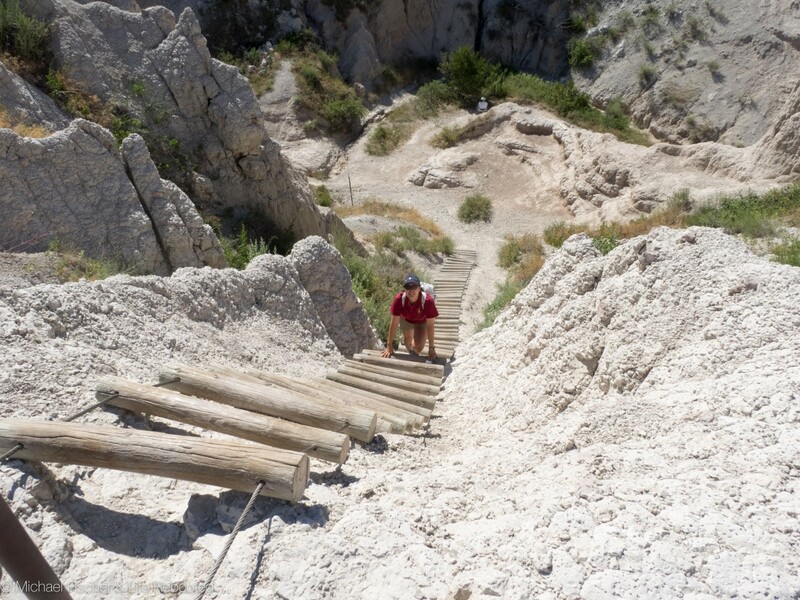 The trail meanders through a canyon then climbs a log ladder and follows the ledge to the “Notch” which has a great overlook of the White River Valley. Originally, Mike was a bit nervous about the ladder but had no issues with the climb or the height. After our last few hikes and lack of height issues, I proclaimed that he is no longer afraid of heights. Mike seemed a little surprised when I made the announcement, but was thoughtful as he realized it seemed to be true! Looking down the Notch Trail ladder. It’s not really as steep as it looks. 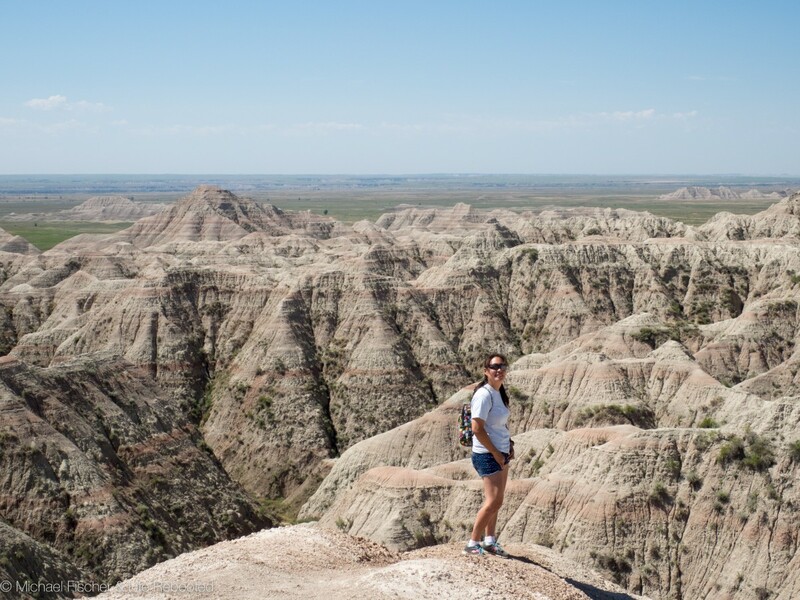 We did two ranger programs at Badlands. The Geology Walk through the Door trailhead explained the history of Badlands, the formations, and geology (duh). This is where we learned the most about the area and how it was created. We also listened to the Fossil Talk which mentioned the fossils found at Badlands and how important it is to report any fossils found since they can erode away in a matter of months. Some of the biggest and most interesting finds have been made by visitors who reported their findings to the rangers. We spent one day driving the Badlands Loop Road, 31-mile stretch of road that passes through the northern area of Badlands. The road is well-maintained with some fantastic overlooks and views peppered with a LOT of motorcycles (due to the Sturgis motorcycle rally). We decided to continue the drive to the tourist trap known also as Wall, SD. 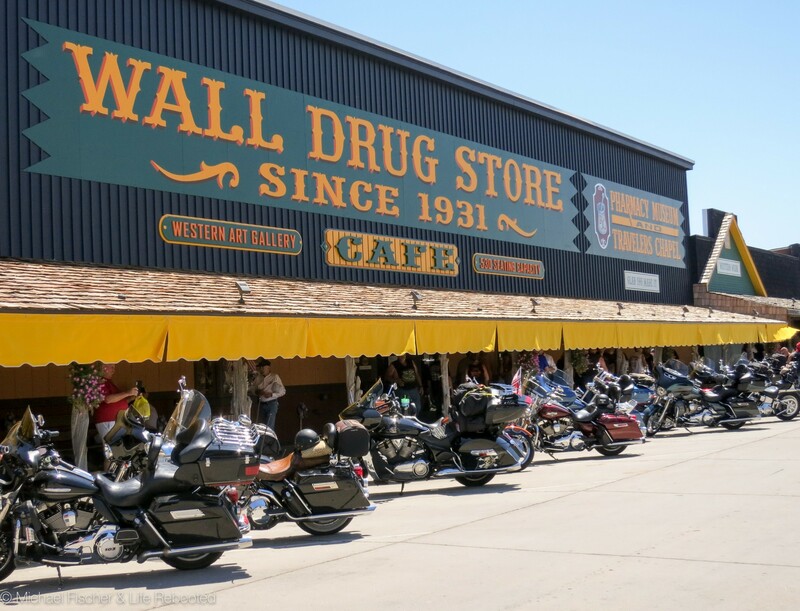 We stopped in Wall Drug and had a bison burger (meh), walked around, window-shopped, and gawked at all the pretty awesome looking motorcycles everywhere. Since we expected a tourist trap, we enjoyed Wall for what it was. 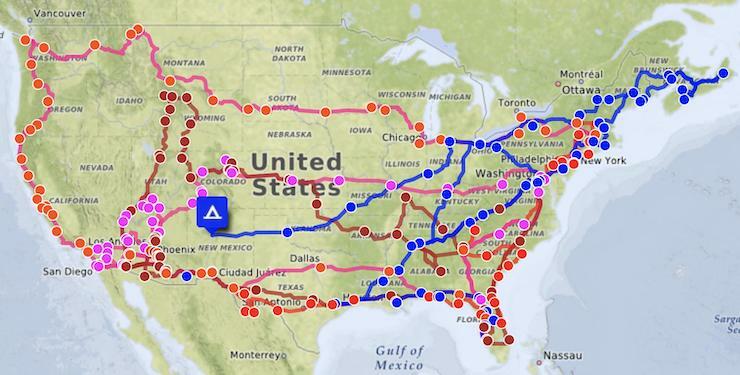 Since we continue to move east, this will probably be the last big National Park we’re visiting for a long time. We’ll be changing our focus to roller coasters, visiting friends, and enjoying our hobbies. 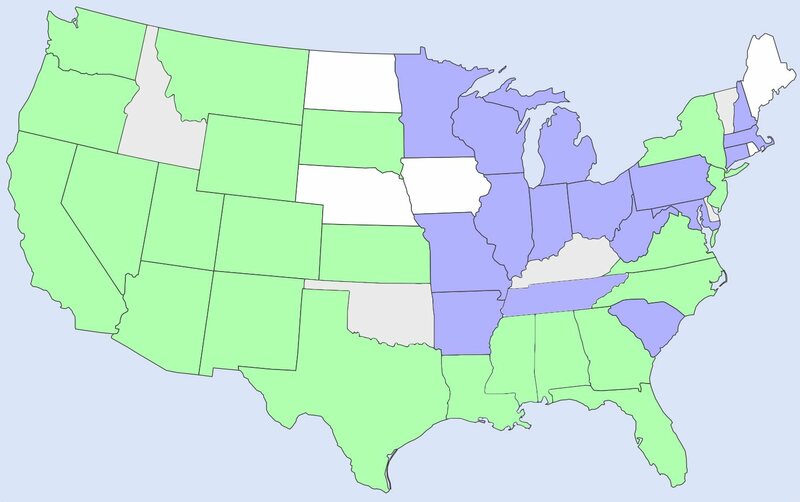 Living in one spot for so long, I can’t believe how diverse and beautiful the rest of the US can be. So far our rebooted life has been pretty awesome! Next trip, we stayed at the RV Park right there near the Visitor Center, and took more time, but did not climb any of those ladders you showed. . .wow! One time at Wall Drug is plenty. . .right? Glad you are enjoying your life on the road. . .it gets better and better. . .
LOL! I totally agree about Wall Drug. Once is definitely enough. I could totally see how it would feel like a western movie, I kept thinking about landing on a foreign planet! We checked out the visitors center. The campground looks cool, but with the heat and no shade, I think we’d be running our generator full-time! That ladder would give me the creeps!! When we first saw it online, we thought it might be a bit much too. In person, it’s not that bad! And the view from the top is nice! It’s harder coming down than up though.